Almost being able to touch a handprint left by someone 5000 years ago is one of the reasons the rock paintings of Astuvansalmi take your breath away. 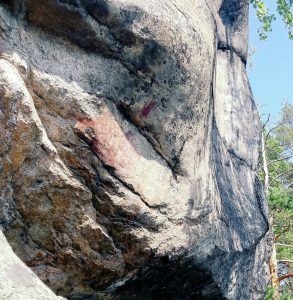 The rock paintings at Astuvansalmi in the Finnish Lakeland are stunningly vivid, cover dozens of motifs, and are included in the largest in Northern Europe. 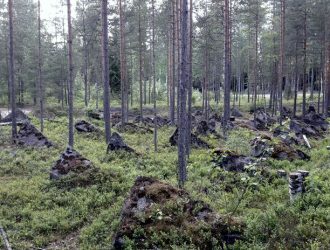 However, they are a bit tricky to reach because it involves a 5km (so 2,5km each way) walk up and down a forest in Eastern Finland. We happened to be there on a particularly hot day with temperatures up to +32C, so our hike was especially tough. However, it was absolutely worth it! 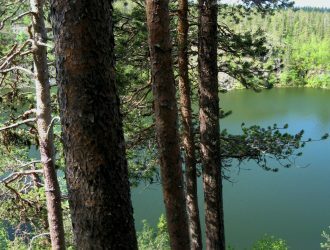 There are several signs pointing to Astuvansalmen kalliomaalaukset near Savonlinna and Mikkeli as well as other Lakeland areas such as Puumala. The Suurlahdentie road is a long and winding one, so we just enjoyed the scenery while driving even though admittedly sometimes it felt like we would never reach our destination. The tiny carpark has a good sign attached to it, announcing that you have reached the rock paintings (however, this is only in Finnish so keep an eye for the word Astuvansalmen). The carpark can be a bit crowded during the busiest holiday months so make sure you park your car safely because there is a curve to the road right around the carpark and you don’t want to cause an accident. We left our car and searched for the beginning of the route. I had misread the guidance and thought it would only be a few hundred metres to the paintings. Yeah… no. 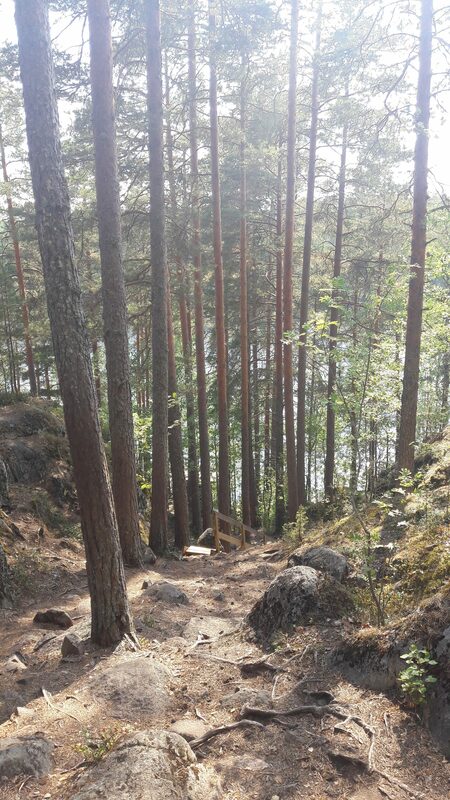 We found a tiny wooden arrow pointing left next to the lake and started off into the forest. There were several rises and falls in the route even though it was fairly easy to walk. 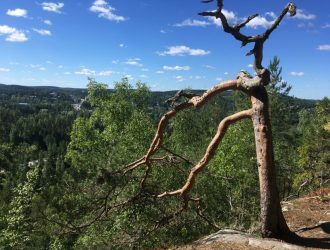 We were surrounded by majestic old forests and cliffs so even though we were being slowly roasted alive by the heat of the sun, there was plenty to enjoy while walking. We even dipped our hands into the lake about halfway to our destination because it was so blue, cool and inviting. The last few rises really tested our resolve because the path got a bit more tricky to walk: you had to take larger steps up onto rocks and descend the same way. 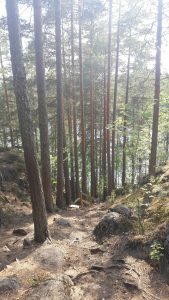 Finally, dripping with sweat and desperate to make sure we were actually not lost, we found wooden stairs which descended steeply towards a glistening lake. As soon as we made it to lake-level, we saw the viewing platform to our left. We leaned as far back onto the lake as we could, straining our necks to get it all in. A very distinctive moose on top, another one at its feet, and some humans. The huge rock wall in front of us was full of red rock paintings created between 3000 and 2000 BC by our ancestors living in the area. There were pictures easily identifiable as moose or as people, several boats as well as some other animals; a total of 65 pictures covered the expanse of the rocky facade. There were even some women depicted on the wall, which is apparently rare in rock paintings. 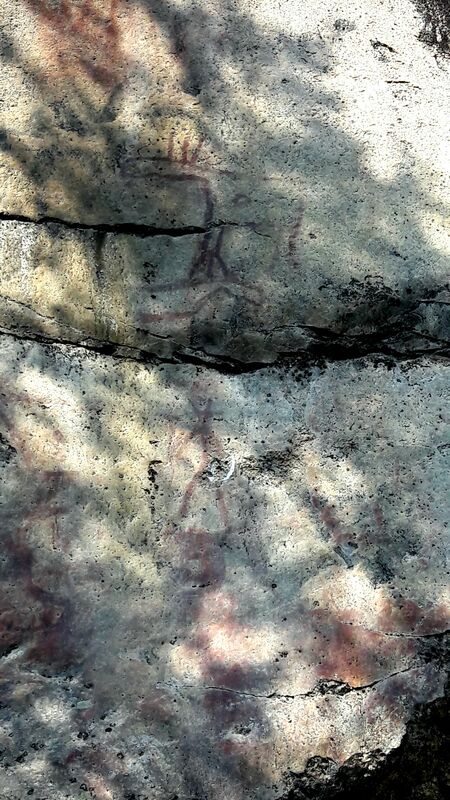 The most touching was a hand print made by a pre-historic person: I felt an instant connection with that person who had touched the same rock several thousands of years ago, and I thought how lucky we were to be able to see these paintings and become a part of the history of the area. We remained immersed in history for about half an hour, looking over to see as many paintings as possible. Some children who had arrived to the area went for a swim (it was a very hot day) even though you couldn’t start a fire due to extremely dry weather conditions and a restriction set by the authorities. We knew we had a long way to walk back but at least this time we knew how long it would take. We had thankfully taken enough water with us so we didn’t collapse of dehydration. 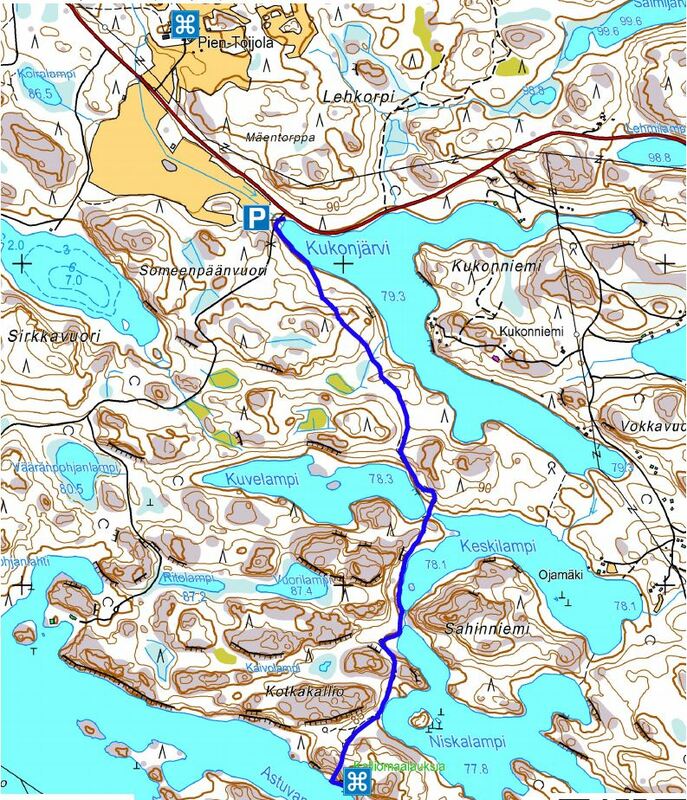 We walked more slowly this time back to our car, enjoying the enormous cliffs and lakes along the route. The paintings at Astuvansalmi were known by locals long before an archeologist called Mr Pekka Sarvas re-discovered them in 1968. The rock facade used for the paintings was smoothed out by the last Ice Age, but an overhang remained intact and kept all the facade and its paintings safe from erosion all these years. The paintings are in different levels because the water surface level lowered gradually over centuries. If you look at the rock facade from a distance, a part of it looks like a human head. This may be one of the reasons our ancestors chose this particular place to paint and worship. Several other artifacts were discovered from the lake next to the paintings. Address: There is a tiny carpark at Suurlahdentie 2039, Ristiina, Finland. Don’t trust Google Maps when it tells you that you can get closer to the paintings by car because the road closer is a private one and shouldn’t be used by tourists. So, leave your car at the carpark and walk. How to get there by foot: The trail has a tiny sign pointing you towards the path. The path starts right after the carpark and curves right next to the lake for a while. Just follow the trail and you will reach the site within 30-45mins depending how fast you walk. How to get there by boat: If you have a boat or you have access to one, you can always sail to the rock paintings. There is a pier there, and Lake Saimaa is one huge network of lakes you can use to get around to pretty much anywhere. Accessibility: The route is manageable for children because they are generally as agile as mountain goats but smaller children may have to be carried over the hardest bits. Not suitable for children’s buggies or wheelchairs. Facilities: There is a small viewing platform on-site. There is a dry toilet (bring your own paper just in case) on-site. You may also be able to use the firepit but make sure you follow local advise on fire safety and check if it’s safe to make fire in the area by referring to this map. 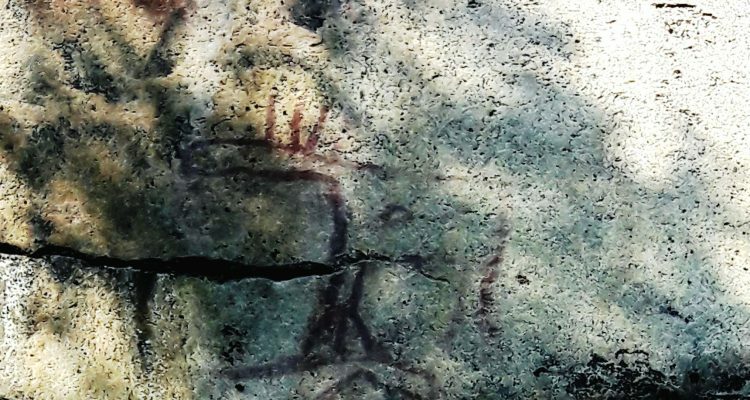 When to go: The best time to visit the rock paintings is when there is no snow. 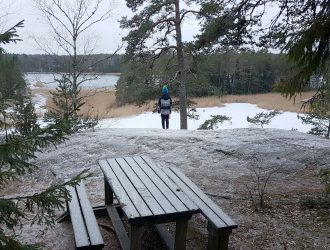 As you have to walk in the forest and on possibly slippery rocks, it is best that you see where you walk, and this is difficult in thick snow or during very icy conditions. What to wear: Walking shoes. Mosquito repellent in the summer. Remember to take plenty of water with you.